Wet soil mixing is also known as the Deep Mixing Method. A powerful drill advances a mixing tool as binder slurry is pumped through the connecting drill steel, mixing the soil to the target depth. Additional mixing of the soil is completed as the tool is withdrawn to the surface. Mass wet soil mixing, or mass stabilization, is performed with a horizontal axis rotary mixing tool at the end of a track hoe arm. The binder slurry is injected through a feed pipe attached to the arm. 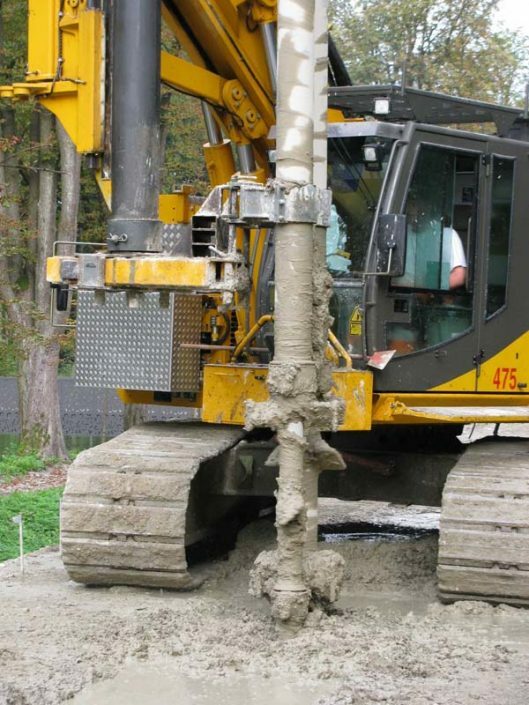 This process constructs individual soilcrete columns, rows of overlapping columns or 100% mass stabilization, all with a designed strength and stiffness. Wet soil mixing is used in nearly any soil type, including organics. If the moisture content is greater than 60%, dry soil mixing may be more economical. The ease of mixing depends on the soil type, strength, water content, plasticity, stratigraphy, and texture. 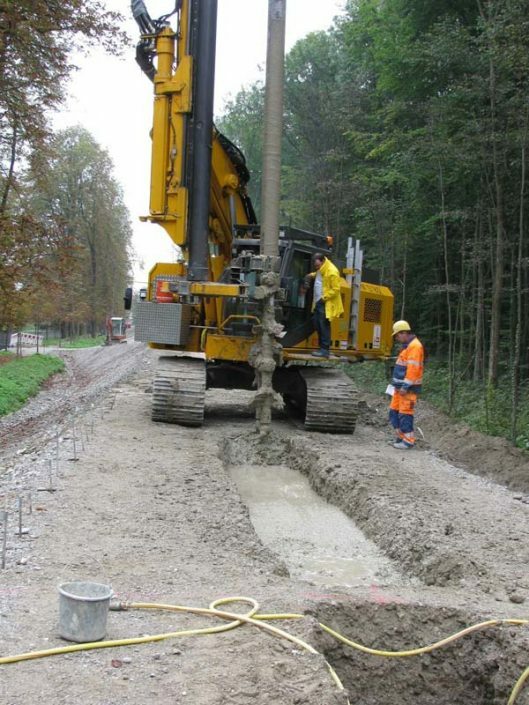 With wet soil mixing, treatment is possible to depths up to 100 feet. Excess soilcrete generated may range from 10 to 40% of the treated volume and has been re-purposed as structural fill. 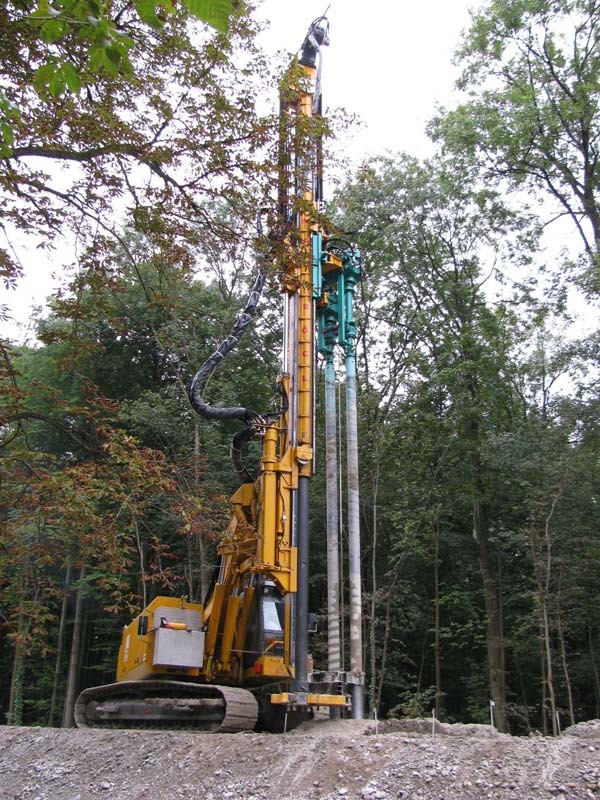 Stiff soils and obstructions are sometimes pre-drilled ahead of the soil mixing process. Pre-production laboratory testing is used to prescribe mix methodology, energy, and the grout slurry system. A single or multiple column test program is often performed at the beginning of the program to determine the mixing energy, penetration rate, batching, and pumping operations. Zemin Corp. has developed proprietary equipment and software for the real-time monitoring of all mixing parameters during the wet soil mixing process. 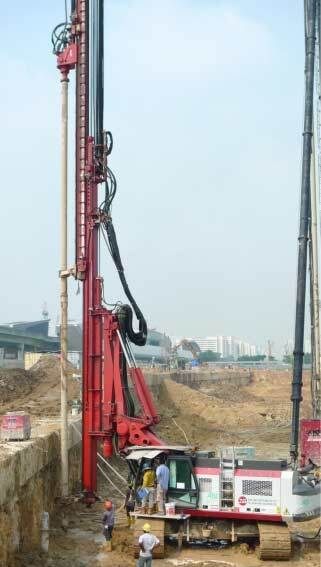 Test columns can be excavated for visual inspection of the soilcrete. Visual inspection is possible with a camera lowered into a core hole. Wet sampling in fresh columns and coring of cured columns can be used to verify strength and permeability.